Born on December 17, 1968 in Cap-Haitien, Frantz was introduced to painting by his uncle, Antoine Obin who guided his first efforts. He was only 8 years old when he started selling paintings to tourists. He is a self taught painter, with a unique style that earned him numerous awards and a well deserved place among Haiti's best painters. Zephirin is a great miniaturist with a tremendous imagination. 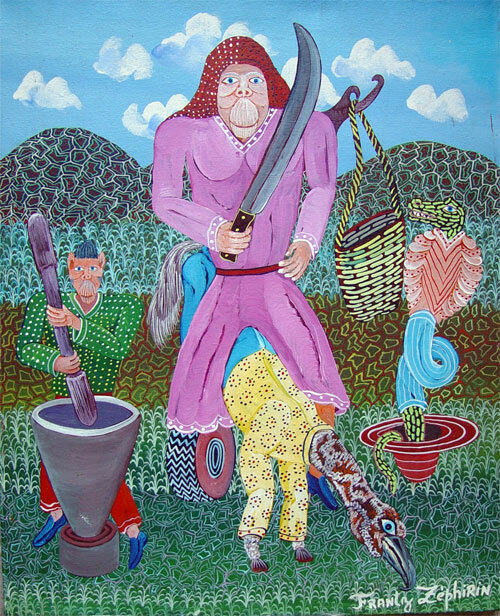 He has exhibited widely in Haiti and abroad and his paintings have been featured in many books on Haitian Art and the show "Sacred Arts of Haitian Voodoo" that toured the USA in the late 90's. In 1996, he won 2 gold medals at the third Plastic Art International biennal of Central America and Caribbean. He is without a doubt one of the major figures in Haitian Painting.